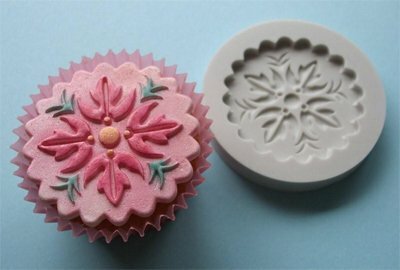 Decorate your cupcakes, or cookies using this cupcake topper mold. This mold is produced using a silicone system specially formulated for use in the food and confectionery industry and complies to FDA (Food and Drugs Agency) regulations in the USA. This very fine detail and flexible mold is reusable. This mold is ideal for use with sugarpaste, flowerpaste, chocolate sugarpaste, marzipan, or melted chocolate, candy melts. Mold comes with simple instruction to use. We will ship your order usually within one business day after we receive you payment. Email us for shipping cost if your country is not listed or if you have any question about the specification. No return nor refund after order has been shipped.